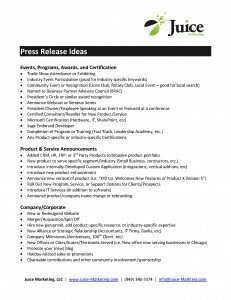 We do a lot of press release writing for Sage and Microsoft partners. What the heck are we going to come up with that’s “newsworthy”? After all, the most successful press release strategies are built around frequency and consistency. But frequency and consistency require fresh and compelling content. So here are a few ideas that might get your creative Juices flowing (yes, pun intended) … oh and if you need help turning that idea into a compelling front page story, check out our VAR Marketing Press Release Program.